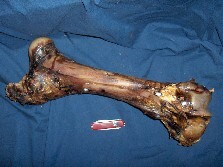 TASTY HICKORY SMOKED BONES MADE FROM USDA Inspected ANIMALS. WE WOULD LOVE TO RECEIVE TESTIMONIALS REGARDING OUR DOG PRODUCTS. PLEASE EMAIL US WITH COMMENTS AND SUGGESTIONS. THANX! Rich "the Meat Boss"
All SMOKED BONE Orders up to 5 lbs. will receive Flat Rate GUARANTEED UPS Ground Shipping for just $9.95 per Box! Shipping Charges do not appear on the checkout tab. They are added later, upon credit card processing. ON +5lb. orders, UNLESS INSTRUCTED OTHERWISE, WE WILL SHIP YOUR ORDER IMMEDIATELY BY United Parcel Service (UPS) at their lowest ground rate plus a $3.00 handling charge WITHOUT A CALL TO YOU TO CONFIRM SHIPPING. CAUTION: Customers have reported that very aggressive chewing can occasionally break a Venison, Elk or Buffalo smoked bone producing sharp edges, so please supervise your pet as to his chewing behavior, and discard any sharp-edged pieces. Price per case or lb. Average Weight 14 to 18 oz. 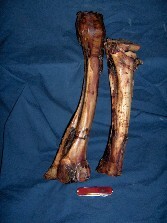 ONE HALF SMOKED Elk Leg Bones, usually as one or two pieces, however can be made available as up to 6 chunks for smaller dogs. Please specify number of bone chunks in comments sectionOUT OF STOCK. 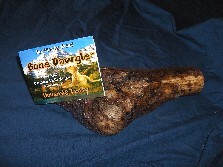 SMOKED ELK NECK Bones All SMOKED BONE Orders up to 5 lbs. will receive Flat Rate GUARANTEED UPS Ground Shipping for just $9.95 per Box! SMOKED Bison NECK Bones All SMOKED BONE Orders up to 5 lbs. will receive Flat Rate GUARANTEED UPS Ground Shipping for just $9.95 per Box! 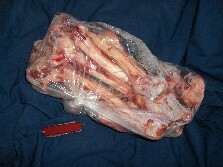 FROZEN RAW Buffalo LEG Bones (10 lb. minimum) When Available. SMOKED Deer Leg Bones All SMOKED BONE Orders up to 5 lbs. will receive Flat Rate GUARANTEED UPS Ground Shipping for just $9.95 per Box! 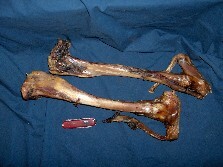 SMOKED GOAT Leg Bones All SMOKED BONE Orders up to 5 lbs. will receive Flat Rate GUARANTEED UPS Ground Shipping for just $9.95 per Box! CAUTION: Please supervise your pet as to his chewing & swallowing behavior. Welcome to Grande Premium's All-natural premium smoked Dog Bone store. For years we have been making Elk, Deer, Buffalo and Goat meat products, all under USDA-inspected supervision for our thousands of satisfied meat customers. Much of that meat has been consumed as smoked jerky and sausage products. Dogs have continually been one of those happy beneficiaries of left-over smoked meat products. So why not create a smoked product just for our Dogs! 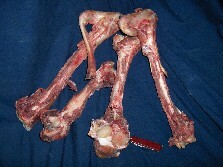 Interestingly, one of the major by-products of our meat production has been the bones remaining after processing. 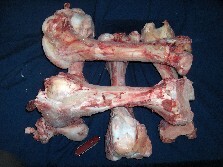 While human-grade USDA-inspected soup bone usage was able to consume a portion of those bones, it has always been one of our goals here at Grande Natural to use all of the natural animal products available, so as to make each animal's sacrifice as productive as possible for us and for our customers. We now have elected to take our delicious hickory smoked jerky expertise and treat your pet to a dog's favorite snack: Smoked Buffalo Dog bones, Smoked Elk Dog bones and even, Smoked Venison Dog bones. What a great taste treat for your dog, human-quality smoked dog bones, all at Grande Premium's always better prices! We sell by the pound, not by the piece, giving you a great smoked dog bone product at a great price. Our dog bones, fresh from the production line are flash frozen for storage and kept super cold until its smokin' time. A quick thaw period followed by 12 hours of slow smoking at 160 degrees produces a fully cooked, moist, delicious snack for your dog that they can enjoy for hours and days. We do not wrap our smoked dog bones in any plastic material so as to decrease the potential for mold or bacterial growth. They are simply stored in cardboard boxes in open air at room temperature (or bit less) and are shelf stable that way for months. Enough moisture has been smoked out of our smoked dog bones to minimize spoilage, but still with enough to retain flavor ..... just like our award winning jerky products! 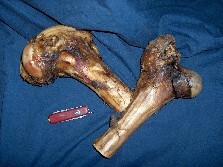 One should select the smoked bone size relative to your dog's size. Large dogs get Buffalo smoked bones, medium dogs get elk smoked bones, small dogs get deer smoked bones. Some mixing is possible, just don't give a big dog a small bone. So whether your dog needs small deer Venison bones, Elk bones or even Buffalo smoked bones, we have what your are looking for. Fully cooked smoked dog bones, easy to store and always ready to eat. Just ask your dog! Shipping Charges do not appear on the checkout tab. They are added later, upon processing. ON +5lb. orders, UNLESS INSTRUCTED OTHERWISE, WE WILL SHIP YOUR ORDER IMMEDIATELY BY United Parcel Service (UPS) at their lowest ground rate plus a $3.00 handling charge WITHOUT A CALL TO YOU TO CONFIRM SHIPPING.